I’ll be walking two to three months per year and the daily distance will be 20-40km depending on the going. I’ll be camping in the wilder parts and staying in guest houses in urban areas. Why do this? I hope to learn more about our mysterious island nation and I can’t think of anywhere else where each footstep leads to such different surprises, beauty and strangeness. Really enjoyed the first 14 days. I’ve put it in my RSS feed because I don’t want to miss a day of it. Quintin- Recently, we have bumped into you twice on your South Devon/ South Cornwall stretch. 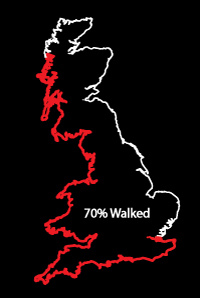 We are about 60% through the Southwest Coastpath and just wanted to wish you all the best. We hope we see you again sometime. I share your sentiments. Will you share your surprises and thoughts, maybe in a book? I think Tony and I have now bumped into you three times in three different seasons and we continue to be inspired by your project. We have only about 3 days to go before we finish the Southwest Coast Path- like you we love every minute of sharing our lives with the sea and the land and when we finish our anti-clockwise journey we are going to turn around and walk it the other way. We hope to see you again soon. I kept an eye open for you as I finished the SWCP coming into Minehead expecting to bump into you for a forth time! Very well done on finishing and the fact you want to go back and do it again is testament to the pleasure of the experience, I imagine knowing what is around the corner will help with pacing oneself to savour the best bits. Great to see your progress on this epic journey and also to see that on 1 Jan 2017 you adopted the motto “Solvitur Ambulado”. Tony and I adopted this motto when we began our Southwest coast path journey just over two years ago- it describes perfectly what walking means to us. We finished the coast path about three months ago and after a few trips going the other way, we have now decided to walk it anti clockwise again but this time in sequence rather than with a number of different starting points. We start from Minehead tomorrow and I plan to keep a daily diary with two or three photographs for each section which will illustrate the most iconic scenes for each section. Very best wishes to you for 2017. Its very apt for us wanders isn’t it. Congratulations on completing the SWCP and good luck for the repeat journey, From my recent camps in south Wales I’ve seen the lights of Minehead over the Bristol Channel which seems like another world. I know I am joining your journey somewhat late, but I find your idea inspiring and wish you continued luck. I am looking forward to reading your future posts, and to catching up with at least some of your previous ones. Brilliantly ambitious, wonderfully obsessive, fabulous photos – hats off to you sir and I wish you the very best with this mammoth undertaking – most inspiring! Thank you. I’d like “wonderfully obsessive” on my tomb stone! What an inspired idea and to bring to life is quite remarkable. Look forward to seeing more of your photography. Thanks very much. There’s wisdom in the first step as the saying goes! Fabulous idea and wonderful photos! Congratulations on your journey so far. My wife, Lyn and I are completing the SWCP this year having enjoyed every minute. We do a week at a time and will complete it in 3 years. Each year we have completed a book and are now working on a massive coffee table picture book of the whole experience. I am still struggling to find Bridges Rocks on the OS Map …. you took one of St Georges Island do you have a grid ref? Great picture . Nick, Thanks! That sounds like a great way to approach the SWCP. I’m sure you find, as I do, that doing it in sections gives one time to reflect on the previous leg and research the next one which makes the overall journey a richer experience St Geoges Island is 2km due south of Looe. Bridge Rocks are 1.5km west of the Island adjacent to the SWCP. It is only marked on 1:25,000 scale, on 1:50,000 that area is called Hore Stone. Good luck with the rest of the walk and the book. What an incredible undertaking! Thank you so much for taking the time to share your journey! Your images are more than just inspirational! We’ve never had the opportunity to undertake something so immense, but are fellow travelers and are always so humbled and warmed knowing the world is full of other humans interested in just a little bit more than the average! Thanks again for sharing! Thanks for your kind words guys! Happy travels…..
Love what you’re doing! My photographer husband and I are attempting to travel over the entirety of Oregon in order of its geological history. It involves a lot of hiking, though we aren’t traveling entirely by foot:) Some documentarian friends of mine are in Ipswich. I’ll share your project with them, and maybe they can put you up near the end of your journey. Thank you that would be welcome. What a fascinating project you are undertaking, and an interesting way to see the landscape in a new way. Good luck with it! Just found your blog courtesy of Discover on WordPress, really fantastic photos and I love walking the coastal path. It’s magical. In fact I think I may have to plan for more of that in the future! Thanks. You won’t regret doing more coastal walking! Thanks for the best wishes Paul, It’s about the contrasts in Blackpool! Any photos taken on the iPhone ? I look forward to reading about your progress so far and reliving the coast of Scotland which I have just completed. Thanks, I’m enjoying it so far! Have you thought about compiling your photos into a book when you complete your journey? It is already 2019 year, are u still walking?